Teams of eight (or four) will set up camp at Ragnar Village as they prepare to conquer a series three pristine trail loops, relay-style, complete with lake views and spring foliage unique to Pocahontas State Park. While not on the trail, participants can enjoy their campsite with teammates, mingle with fellow competitors, and visit Ragnar Village, which will include yoga, bonfires, s’mores, live music, sponsor giveaways, and more. 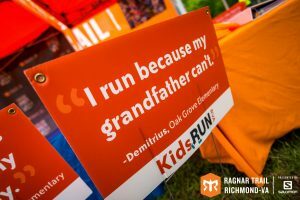 2019 marks the third year that Ragnar Trail and Sports Backers have partnered on Ragnar Trail Richmond-VA, and with over 200 teams each year it has quickly grown to be one of the most popular trail relay events in Virginia. Kids Run RVA, a Sports Backers youth running and fitness initiative, serves as one of the official event charities of Ragnar Trail Richmond-VA. Kids Run RVA reaches thousands of young people across the Richmond region and has run clubs in nearly 70 schools and neighborhoods, including many underserved communities. The program gives youth the chance to have fun while being physically active in their own communities and gets thousands of kids moving throughout the Richmond area on a daily basis, with the goal of establishing healthy habits early in life that are critical to the long-term physical, emotional, and social development of all children. Kids Run RVA works to break down barriers and provide all kids the opportunity to participate in daily physical activity. For more information or to register your team for Ragnar Trail Richmond-VA, visit www.runragnar.com/event-detail/trail/richmond_va#overview or www.sportsbackers.org.